When he was born, Queen Victoria had almost another decade to rule. He died near the end of Margaret Thatcher’s first term. While he lived through nine decades of remarkable change, composer Herbert Howells came of age at a time when artists were already being haunted by cultural turmoil and uncertainty. In 1913, when Howells was 21, the French poet Charles Péguy judged that “the world has changed less since the time of Jesus Christ than it has in the last thirty years.” While some Promethean souls were energized by the possibilities opened up by the dynamism of creative destruction, other artists, writers, and composers were less sanguine about the brave new world being ushered in by the cold dawn of the twentieth century. Near the end of the century’s first decade, Gustav Mahler completed his Ninth Symphony, inscribing over the final note the epitaph ersterbend, “dying away,” thus confirming the Ninth’s sense of imminent loss. Leonard Bernstein describes this work as Mahler’s “reluctant and protracted farewell to tonality,” a loss of confidence that the Western musical tradition of harmony and melody could survive the cultural dislocations already evident in the nineteenth century. During a 2003 performance of Mahler’s Ninth, film critic David Thomson detected in the music a “foreboding that melody itself was stricken, or dying,” and perhaps — more comprehensively — “fears that humanism and knowledge and reason are themselves failing.” Mahler’s Ninth was hardly distinctive in its pessimism: countless works in all creative media echoed the theme of cultural breakdown. In September of 1910, the same year that Mahler completed this ominous work, the seventeen-year-old Howells (then an organ student at Gloucester Cathedral) attended the premiere performance of Ralph Vaughan Williams’s Fantasia on a Theme by Thomas Tallis. It was the most significant fifteen minutes of the young man’s life; he would later observe that “if I had to isolate from the rest any one impression of a purely musical sort that mattered most to me in the whole of my life as a musician, it would be the hearing of that work.” While Mahler was anxiously anticipating the death of Western harmonic music, Howells was hearing something of its future, a future reconnected with the premodern musical past — a past not incidentally animated by corporate worship. Several years after hearing how a twentieth-century composer could engage sixteenth-century musical craftsmanship, Howells was exposed to more music from the Renaissance, this time not in a concert hall, but in London’s Westminster Cathedral during a Roman Catholic liturgy . The choirmaster at the cathedral, Richard Runciman Terry, had begun a revival of interest in Gregorian chant and in long-neglected works of Renaissance polyphony, drawing from continental as well as English sources. Howells had begun studies at the Royal College of Music under Charles Villiers Stanford, who urged his students to enjoy “Palestrina for tuppance.” For the price of busfare to the Cathedral, Howells and his fellows were able to hear not just Palestrina, but works written for the Catholic liturgy by Tallis, William Byrd, and Peter Phillips. Early on, Howells came to sense that the future of music was in its past, not in a servile imitation, but in the rediscovery of musical resources that had been lost. He once wrote that great works of art required artists “who can master the present through the wisdom of the past.” The music that Howells composed — especially that written for liturgical use, about a third of his total output — demonstrated that one could be both a steward of tradition and an innovator. by the late 1940s a noticeable change was evident in Anglican music: the functional had been replaced by the atmospheric, the respectable by the mystical, and beneath the traditional surface was music of an other-worldly and impressionistic quality. First-time listeners to Howells should remember that beauty, no less than truth and goodness, can be very demanding. 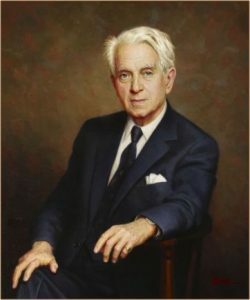 His music can sometimes be challenging, employing what Phillip Cooke calls “soft dissonance.” It is not superficially pretty music, “but it is never too dissonant to disrupt the continuum of tradition to which Howells felt very much connected.” That connection is something listeners (and singers) can share, experiencing in Herbert Howells’s gifts to the Church the union of time and eternity, of tenderness and triumph.